Observations from space... support previous indication of eruption on Wolf (Event Card 1749), and suggest strong thermal activity on Darwin. . . .
Close inspection of NOAA-2 imagery shows hot spots reported on Event Card 1752 coincide with caldera floors, not outer flanks, and can probably be explained by normal daytime temperature differences. . . .
Card 1752 (13 December 1973) F. Parmenter, NOAA; M. McEwen, NASA; J. Filson, MIT; T. Simkin, SI. Card 1757 (17 December 1973) A. Krueger and F. Parmenter, NOAA; J. Filson, MIT; P. Kramer, Darwin Research Station; T. Simkin, SI. The Global Volcanism Program has no Weekly Reports available for Darwin. ". . . recent inspection of volcano Fernandina . . . shows that the caldera has not resumed the collapse begun in 1968. 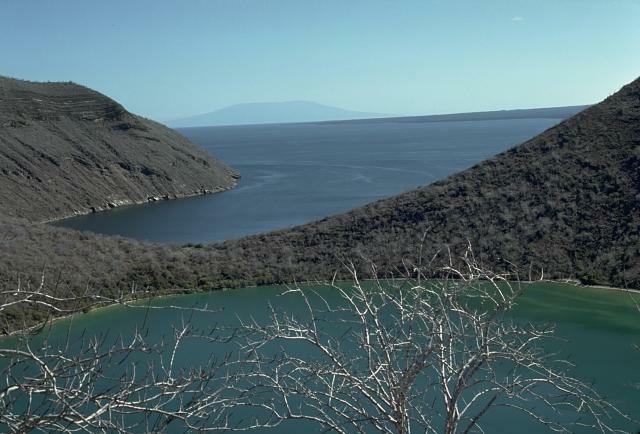 The caldera remains essentially the same and aerial reconnaissance of nearby calderas, Wolf and Darwin (Isla Isabella) are likewise unchanged. . . ."
Information Contacts: Educational Expeditions International Research Team, Galapagos Islands, Ecuador; T. Simkin, SI. Volcán Darwin, named after the renowned naturalist, contains a symmetrical 5-km-wide, 200-m-deep summit caldera whose floor is nearly covered by youthful lava flows. A broad terrace occupies the SW part of the caldera. Fresh-looking, unvegetated lava flows descend all flanks and reach both the eastern and western coasts. The most recent summit activity produced several small lava flows from vents on the east caldera floor and NE and SE caldera rims. Radial fissures descend the flanks, and one reaches beyond its base to the the SW coast and cuts Tagus tuff cone. The sheltered anchorage of Tagus Cove breaches the southern side of the cone and was visited by Darwin and other noted visitors. This prominent tuff cone and its neighbor Beagle (also breached to the south) are located on the SW-flank coastline and were a prominent part of Darwin's geological studies in the Galápagos Islands. Geist D, Harpp K, Reynolds B, 2006. 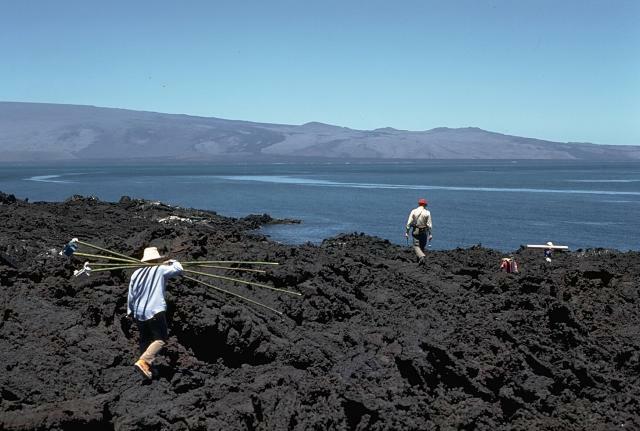 A field trip guide to the geology of the Galapagos Islands. Cities on Volcanoes 4, Quito, Ecuador, 23-27 Jan, 2006, Field Trip Guide, 30 p.
Remarks: Deformation at Darwin during 1992-1998 can be modeled by a Mogi point source. Deformation at Darwin volcano during 1992?98. a, Radar interferogram of Darwin volcano showing 0.2 m of LOS displacement (uplift). b, Predicted interferogram from the best-?t Mogi model with source location in the centre of the caldera (star) and depth of 3 km. Each colour cycle represents 5 cm LOS displacement. Observations at Wolf and Cerro Azul during 1992?97/98, and at Fernandina during 1998?99 are also well ?tted with Mogi models at depths of approximately 2, 5 and 3 km, respectively. There is no Emissions History data available for Darwin. 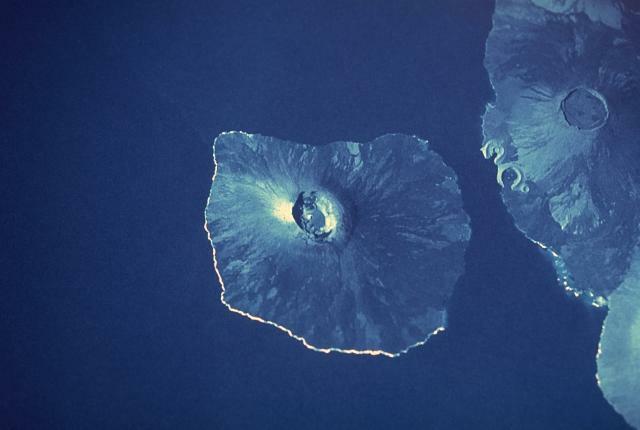 Two massive Galápagos shield volcanoes, their slopes darkened by young unvegetated lava flows that reach to the sea, appear in this space-shuttle photograph. Fernandina volcano, the most active in the Galápagos Islands, forms a 30 x 34 km wide island with a 4 x 6.5 km wide caldera at its summit. 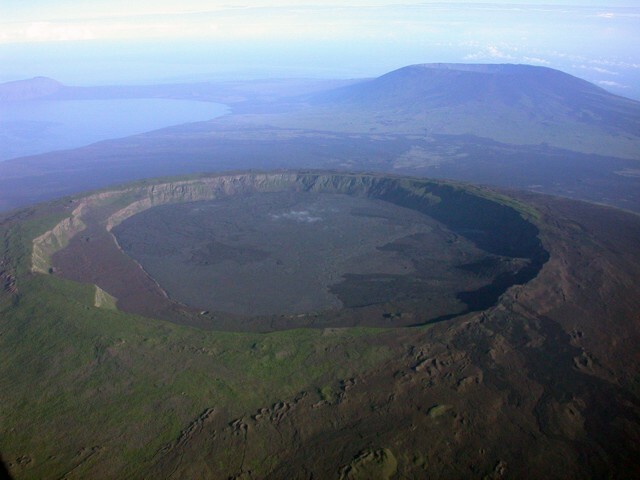 Darwin volcano, north of the midpoint of Isabela Island, has a 5-km-wide summit caldera. The tuff cones of Tagus and Beagle are prominent along its western coast. The light-colored area south of Darwin is the lower western flank of Alcedo volcano. Shuttle photo by National Aeronautical and Space Administration (NASA), 1989. Volcán Darwin, named after the celebrated naturalist, rises above a narrow channel opposite Point Espinosa on the NE tip of Fernandina Island. Darwin volcano contains a symmetrical 5-km-wide summit caldera that is nearly filled by lava flows. The most recent summit activity produced several small lava flows from vents on the east caldera floor and NE and SE caldera rims. Two breached tuff cones on the SW-flank coast, Tagus and Beagle, were a prominent part of Darwin's geological studies in the Galápagos Islands. 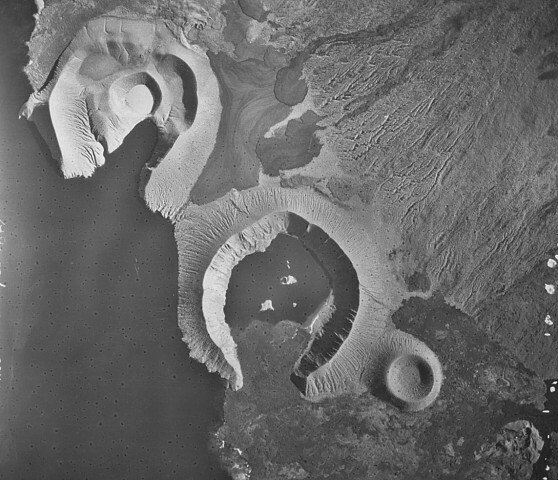 The renowned tuff cones of Tagus (upper left) and Beagle (lower right) were formed by phreatomagmatic eruptions along the coast of Darwin volcano in the Galápagos Islands. The rim of Tagus is breached by Tagus Cove, a storied anchorage in the Galápagos archipelago visited by Darwin's vessel, the Beagle. Tagus tuff cone has at least four nested craters, the youngest of which contains a small salt lake. Fresh black lava flows from fissures on the flanks of Darwin volcano largely surround the tuff cones. Aerial photo by U.S. Air Force. 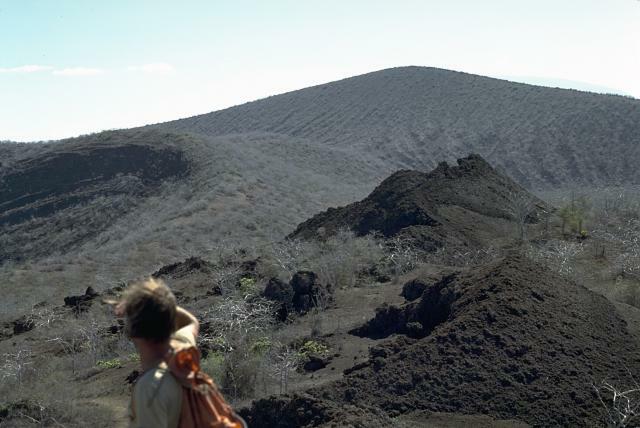 The spatter cones at the right are part of a chain of conelets built of scoria and lava agglutinate erupted from a SW-flank radial fissure from Darwin volcano that cuts across the rim of Tagus tuff cone. Tagus tuff cone contains at least four nested craters. The rims of three of these craters are seen in the backgound. Phreatomagmatic eruptions, resulting from the interaction of magma with seawater, produced the tuff cones. 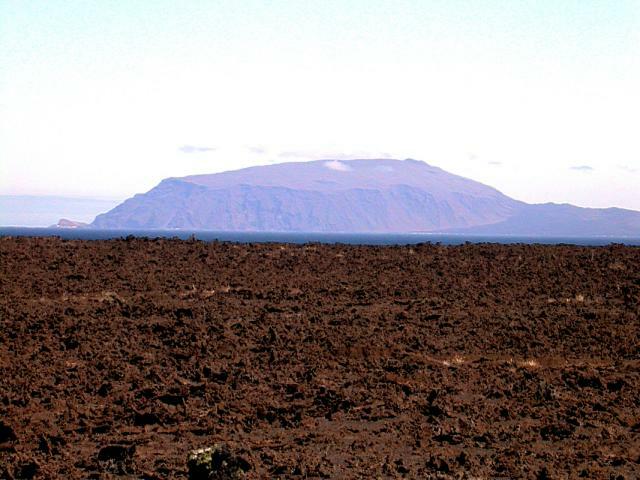 The smooth flank of Darwin shield volcano, seen here from the east coast of Fernandina Island, is modified by a cluster of tuff cones near the SW base of the volcano. The Tagus and Beagle tuff cones (right center horizon) were formed by phreatomagmatic eruptions along the SW coast of Darwin. Fresh black lava flows erupted from fissures on the flanks of Darwin volcano descend to the sea on both sides of the tuff-cone complex. This dramatic Space Shuttle photo from a 1988 mission shows five major calderas of the Galápagos Islands. Caldera diameters capping these basasltic shield volcanoes range up to 8 km. At the lower left is Fernandina volcano. 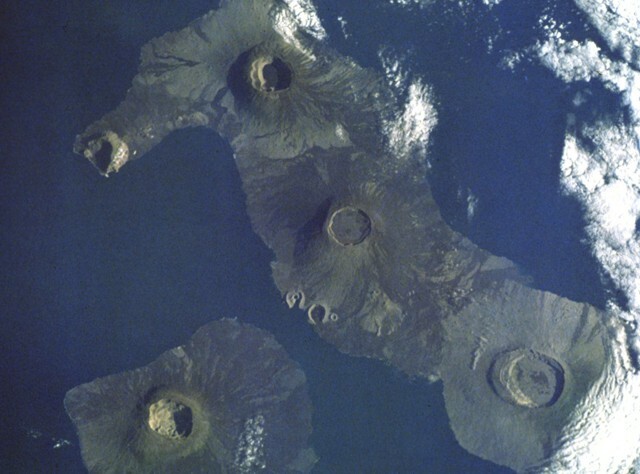 At the lower right is mostly vegetated Alcedo volcano on Isabela Island. Above and to the left is Darwin volcano, with the two prominent breached tuff cones, Tagus and Beagle, on its SW flank. Volcán Wolf is at the top of the photo, and Volcán Ecuador with its breached caldera forms the NW tip of Isabela Island. Shuttle photo by National Aeronautical and Space Administration (NASA), 1988. Volcán Ecuador, which straddles the equator at the NW end of Isabela Island, rises beyond a lava flow near Beagle tuff cone on the flanks of Darwin volcano. Ecuador is the smallest of the six large shield volcanoes on Isabela and is broadly breached to the coast on the side opposite this view. 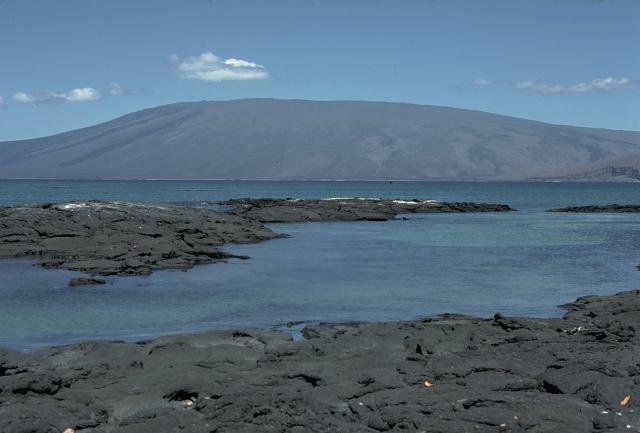 No historical eruptions are known; however, the youthful morphology of its most recent lava flows resembles those of very recent flows on other Isabela Island volcanoes. A line of NE-trending fissure-fed vents (right horizon) extends to the SE. Photo by Ed Vicenzi, 2002 (Smithsonian Institution). A spectacular aerial view from the SE shows the caldera of Darwin volcano in the foreground, with Volcán Wolf in the right background and the tip of Volcán Ecuador at the NW tip of Isabella Island on far left horizon. Volcán Darwin, named after the renowned naturalist, contains a symmetrical 5-km-wide, 200-m-deep summit caldera whose floor is nearly covered by youthful lava flows. A broad terrace occupies the SW part of the caldera (left side). Fresh-looking, dark-colored lava flows from flank fissures are visible between Darwin and Wolf volcanoes. The Global Volcanism Program has no maps available for Darwin. There are no samples for Darwin in the Smithsonian's NMNH Department of Mineral Sciences Rock and Ore collection. Large Eruptions of Darwin Information about large Quaternary eruptions (VEI >= 4) is cataloged in the Large Magnitude Explosive Volcanic Eruptions (LaMEVE) database of the Volcano Global Risk Identification and Analysis Project (VOGRIPA).